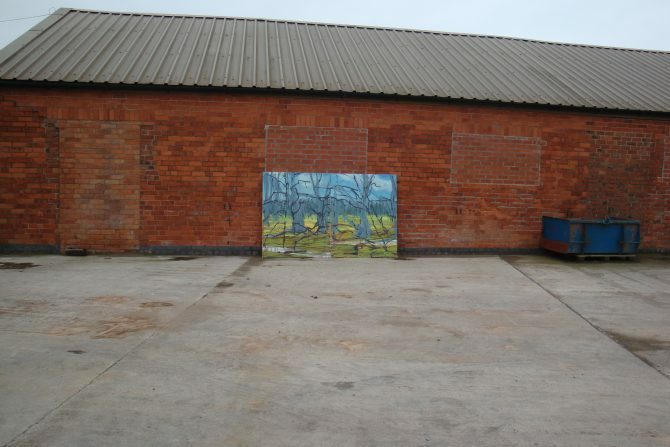 A few pictures of the big studio at Kirklington – the Cowshed where I can do large work, mainly in summer (it’s freezing in winter), and the winter studio at home (garden shed) which is nice and cosy and overlooks the field I’ve been painting for a couple of years. This week I’ve been finally moving work out of my old studio at our house in London. In truth I haven’t worked in there for a number of years, and now the house is being sold so I have to go through all the old stuff and sort it out. Now the website is up and running it’s a good time to catalogue everything and I can make an archive section showing a few images of past work. This could take a while but I’m looking forward to doing that, and i’ll try and add a bit at a time.